If you are interested in staying here, you will need to send a message to the host Andrew indicating your interest. For a formal booking to ensue, Andrew will need to send you an "invitation to stay", which you can then accept. Kalani Tiny House, bathroom, kitchenette/laundry and courtyard. The "Kalani" Tiny House with private sun filled courtyard. Enjoy all the amenities on offer. Private entrance, and car space. Recently completed, including reverse cycle air conditioning. Shower inside or outside, your choice. Complete with its own fast speed wifi. Bring your devices to watch online TV etc. Or better still. Leave electronic devices at home and absorb the beauty of the Byron Shire and all it has to offer. Private laundry and kitchenette is included, complete with convection microwave oven. Additional appliances may be available for longer stays. This is a stand-alone unit with your own dedicated entrance into your private fenced courtyard. Total independence and privacy. English and Croatian. Very fluent in both. This unique home is located in Suffolk Park, New South Wales, Australia. 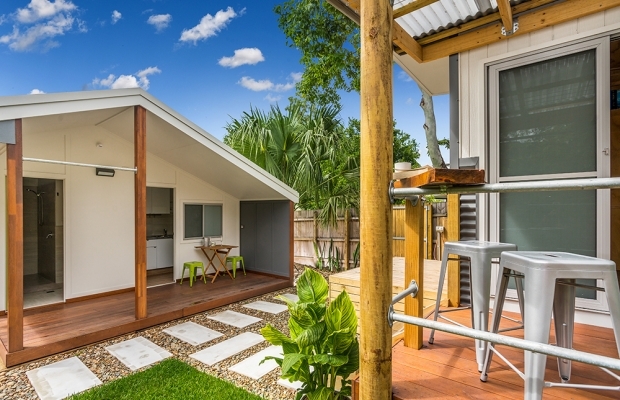 Suffolk Park is Byron Bay’s “best kept secret” with a laid back atmosphere and a tranquil calm that is away from the tourist crowd and activity. Suffolk Park is a quiet village on Tallow Beach with long white sandy beaches accessible at several points, and its own shopping village. Short stroll to Tallows Beach, Suffolk Bakery, Pizza Paradiso, Tullys Cafe, Yellow Flower Indian Diner, The Park Hotel, Chemist, Spar, Post Office and BP service station. Everything you need is available within walking distance. Drive, Uber, Taxi or bike ride into Byron. I'm Andrew. I live in paradise..... "Byron Shire". I'm a Carpenter/Builder, and I enjoy creating memorable spaces.